We thank the community for the ideas, information, support and time they have put in over the last year and a half as we designed this project together for the community. Your feedback has been very positive and supportive. Thank You. Read about the history of this great building. 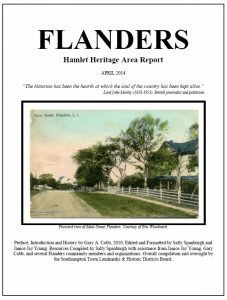 We thank, Sally Spanburgh, Gary A. Cobb, and Janice Jay Young for the effort, time, and energy they put into to writing this Hamlet heritage area report. It truly made a difference in the way view this building, and history which comes with it. Preface, Introduction and History by Gary A. Cobb, 2010; Edited and Formatted by Sally Spanburgh and Janice Jay Young. Resources Compiled by Sally Spanburgh with assistance from Janice Jay Young, Gary Cobb, and several Flanders community members and organizations. Overall compilation and oversight by the Southampton Town Landmarks & Historic Districts Board.